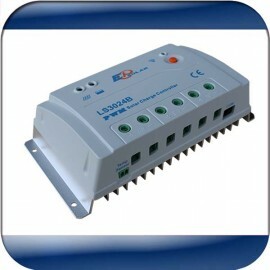 LS3024B solar controller is rated 30Amps. This is used in solar energy photovoltaic systems working of solar panels, batteries and loads. This has overcharge, overload, under voltage, short circuit protections etc. YSOLAR30 solar controller is rated 30Amps. This is used in solar energy photovoltaic systems working of solar panels, batteries and loads. This has overcharge, overload, under voltage, short circuit protections etc. WS-C2415 solar controller is made by WELLSEE and rated 15Amps. This is used in solar energy photovoltaic systems, which coordinates the working of solar panels, batteries and loads. This has overcharge, overload, under voltage, short circuit protections etc.